One of the big issues at Los Angeles International Airport (LAX) is the inability to make connections between terminals without having to leave security. This has been slowly changing, and now we have the biggest improvement yet. The post-security connector between American’s Terminal 4 and the Bradley International Terminal is now open, and it’s even better than I thought it would be. I took a walk through it when I was flying out last week. Thanks to a network of tunnels and corridors, anyone traveling between the Bradley Terminal and Terminals 4 (American), 5 (Delta), 6 (Alaska), and 7/8 (United) will be able to walk back and forth without leaving security. This will make for faster and easier connections, though clearly those walking from United’s terminals will have quite a long walk ahead of them. What I didn’t realize before is that those arriving internationally will also benefit here, but we’ll get to that a bit later. Right after going through security in Terminal 4, travelers will see the entrance right there on the west side of the concourse. This used to be a wall, but now it’s open and shares space with the gate 41 waiting area. After going upstairs (escalator/stairs/elevator), you head into a corridor with great views of the ramp. The corridor quickly opens up into a large, semi-triangular space. You keep walking forward toward the moving walkways to head into the Bradley Terminal, and I couldn’t figure out why this needed to be so big. Then I figured it out. On the right, there is what will be a door. That’s going to be an exit for people who have arrived at the Bradley Terminal from an international flight, but it hasn’t opened just yet. You can see out the window in the next photo, immediately below where I am, that there’s a ramp coming up from the arrivals level. When passengers go through immigration and customs, they’ll be able to follow the signs to connecting flights. They can re-check bags and then immediately go through a new security area that leads up a ramp into the connector. That’s going to make things move much more quickly for those connecting off an international arrival in Bradley. There are still windows in this part of the walkway and you can look back on the curvy new connector. Once through the first part of the Bradley terminal, it opens up into this really cool suspended tunnel with floor-to-ceiling windows on both sides. It has a fantastic view down into the ticketing and security areas in Bradley. At the end of that walkway, it’s time to head into the terminal. There is a set of escalators to do just that. This goes down into an area where there’s a little dog park. After a short walk further along, you end up in the center of the Bradley Terminal, past security. I know I put a lot of photos in here, and it sounds like it might be a long walk, but it’s not. It’s probably 5 minutes from Terminal 4 to Bradley, and you can retrace your steps to come right back the same way (as I did to catch my flight). For American travelers, this is a big development. American has some flights operating from Bradley, so this allows people to go back and forth between connections with ease. 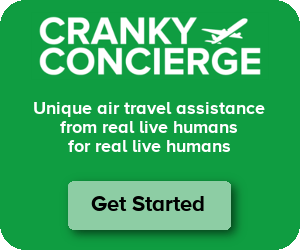 It also allows people to connect from American domestic flights to a variety of international partners including British Airways, Air Berlin, Cathay Pacific, Etihad, Japan Airlines, Qantas, and more. Considering the minimum connect time from American to British Airways is 1h30m today, this should be able to drop dramatically, make for quicker connections, and get people where they’re going faster. But it’s not just good for American. It’s good for every airline on the south side of the airport. Most importantly, this will make connecting a whole lot easier for a bunch of people. Continue the conversation via emailGet only replies to your comment, the best of the rest, as well as a daily recap of all comments on this post. No more than a few emails daily, which you can reply to/unsubscribe from directly from your inbox. Have you done the walk all the way to United? I was in LA a few weeks ago and had a couple of hours before my flight to London. Had the uber driver drop me off at TBIT because it’s always fascinating to see the airlines that don’t come to SFO. The hamster trail between 4 and 8 is really cool. It’s not more than a series of long underground passageways with terrorist gates interspersed for good measure. It’s certainly not at all passenger-friendly, but it is real. Clearly the adjacent connections for American and Delta make sense as someone might actually be connecting. And the passage between 6 and 7 is great in order to avoid the lines at United. Davidrosen – Yep, I’ve walked the whole length as well. The corridor between T4 and T5 is currently the most sterile-looking in my opinion. The one from T5 to T6 has at least been prettied up by DL. Then from T6 to head upstairs, I agree it’s an easy walk on the concourse over to 7. But it just takes time. Will there be a similar connector constructed between Bradley & terminals 1, 2 & 3? If Delta gets its way, and is allowed to take over 2 and 3, and rebuilds 3, then it’s possible a connecter will be built to TBIT. However, Terminal 1 (and, if built, Terminal 0) will not be connected. SEAN – There were plans from T3 but those are no longer in the mix. Presumably the aforementioned T2/T3 project that DL is putting together would eventually want to include that connector. But it does seem that T1 will remain on its own for a long time. In a way cranky that makes sense. Since Southwest doesn’t partner with other airlines, T1 doesn’t need to be joined to T2 & 3. However – functionally it should be connected to make traveling through the airport easier. SEAN – The biggest problem is that Southwest has started flying international from LAX and there is no customs facility in T1. They’re using T2 today, but who knows if that’ll be allowed if Delta moves in. Ultimately, T0 should be built with a customs facility. But that’s years away at best. As CF mentioned, they’re going to put in a new security checkpoint for connecting passengers. Ed.Jacob – As others said, there will be a new security entrance right after where you’d go to re-check your bag for connections. Looks nice and should help move people along. Now to do something about the auto traffic to help people move along. This also allows a way for PreCheck-eligible passengers to get into TBIT without having to go through standard screening. For a domestic to int’l. connection (AA to ElAl for example) where does the enhanced int’l. security occur? pf – There is no enhanced security. I mean, they’ll check passports at the gate, but that’s about all. El Al may be an exception. I have no idea what’ll happen there, but possibly El Al might redirect you back to the counter if you haven’t checked there first. Not sure. Do you really want to know? On the flip side, if some hazardous product like toothpaste gets through the security check, will TSA need to clear out all the terminals that are connected instead of just one? Jim – They do have security doors that they can drop in situations like that. TSA won’t want to take a chance…can you imagine the bad publicity if it turned out an explosive device did squeeze through and detonate because they didn’t evacuate all the interconnected terminals? Seems unlikely. If they can lock security doors and review cameras there would be no need to evacuate. I’d suspect they’d also want to avoid evacuating terminals, in general, it would paralyze the airport to have so many people flood onto the horse-shoe. I was just about to ask you on Twitter if you’d had a chance to walk the Connector and here’s your post, right on time. :) Obviously there’s no official announcement, but have you heard anything else (rumor/whisper-wise) about whether AA will actually be getting T5 if/when Delta moves? I wonder if it would be possible to knock down walls between 4 & 5 to make one large Terminal building with two concourses. Marcus – If Delta moves out of T5, then it’s highly likely that American will get some gates there. But from what I hear, it’s unlikely that American itself would get all the gates there. Used to hate flying through LAX (from Australia or Japan) and would go to almost any other city to avoid it (apart from SFO!) but the changes/massive improvement to TBIT and now the connecting walkway which I used last week connecting T4 with JAL flight makes a huge difference. Recent experiences have certainly changed my perception. Obviously this was done to improve passenger experience but I dont know if LAX realises what a MAJOR difference connecting the terminals behind security makes and I will definitely look to use again more regularly. Any idea when the TBIT FIS ->TSA ->T4 connector will open up? I have a JAL->AA connection in mid April where I would love to use the QF lounge in TBIT without having to walk to T4 and back around. If it’s not open, just go back through security in TBIT, visit the QF lounge, then use the connector to go to T4 or T6 for your AA flight. If you’re lucky, you could end up on an AA flight usi a TBIT gate even. Even before the connector was open, LAX was advertising that you could use any boarding pass to go through security in any terminal to use other terminal amenities. John – I don’t know the answer I’m afraid. Brad – You always have to collect bags, recheck and redo security when you enter the US. Depending upon when you’re flying, you could in theory come back through T4 but it’ll probably be customs/immigration in TBIT for now. Just walk outside security, you’ll see a bag recheck area for connections on American, and then if the new connector is open you can enter security there. Otherwise, just walk to T4 next door. My sister & her family will be flying AKL (NZ) X/LAX (UA) LHR (I.e. AKL-LAX on NZ then transit to LAX-LHR on UA) in December 2016. Does this mean that after collecting baggage, going through security and re-checking bags, they could use this connector to their UA international flight? I really hope the exit from International Arrivals at TBIT is open by then, if so. Is there an expected date for this to open. If this is not open, can they still use the connector to get to their UA flight? Adrian – Yep, if it’s open they’d be able to do that. Alyanna – No, but it’s a long walk behind security. I,m international passenger .can I use this connector to transform ? Hi. Would you know if baggage carts are allowed on the new connector? Thanks! I don’t imagine there are any specific rules against baggage carts. Self-Cleaning Toilets Sound Great, But Why Not the Entire Airplane?